Upper North Fork. Click the image to enlarge. 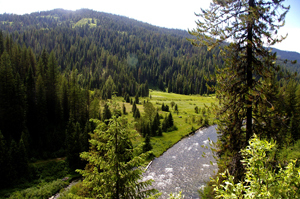 Upper North Fork Roadless Area is 63,000 acres of strikingly varied and majestic landscape unfolding on the Idaho/Montana border. This description includes the adjacent Rawhide Roadless Area since, for all practical purposes the areas are contiguous. The long-defunct Rawhide Road (today just a dirt trail) is all that separates them. Located approximately 40 air miles west of Missoula, Montana, this country ranges from narrow, flat valley bottoms to steep breaklands framing drainages; from sloping meadows and shady woods to jagged ridges and carved cirque basins. Sharp, rugged relief above 7,000 feet occurs along the Bitterroot Divide, separating Idaho/Montana, with a few glacial lakes punctuating the ridges. Topography softens in the North Fork Clearwater drainage, dropping to just under 4,000 feet, where the watercourse leaves the area. Upper North Fork contains six lakes and the headwaters of two important river systems: North Fork Clearwater and St. Joe. Among the varied terrain three major vegetative ecosystems are found. 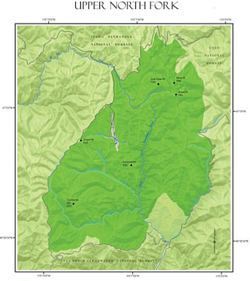 A cedar-hemlock-pine forest encompasses lower elevations in the North Fork of the Clearwater River, Meadow and Chamberlain Creeks. Ascending slopes up to 6,000 feet spreads western spruce-fir cover. Alpine meadows, carex, and beargrass carpet the high ridge elevations. In the early 1900s these regions met the same fate as many in the Clearwater Basin: fire, with the resulting regeneration evident in stands of slender, even-aged lodgepole pine. Other species present include subalpine fir, western larch, mountain hemlock, grand fir, and white bark pine. The region is crucial habitat for elk, lynx, moose, black bear, whitetail and mule deer, grizzly bears, and a plethora birds and other animals native to conifer-covered mountains in North Central Idaho. The unmatched cold, clear waters of Meadow Creek is the most important spawning and rearing locale for bull trout in the state. Cutthroat and rainbow trout find it and the other creeks and lakes apt habitat as well. In addition to supporting crucial ecological systems, the Upper North Fork contains unique natural and cultural features. The large size, varied topography, and dense vegetation screen provide remarkable opportunities for solitude and for experiencing the incomparable countryside, be it through hiking, camping, horseback riding, hunting, fishing, or photography. Stateline Trail, which extends north from Hoodoo Pass along the Bitterroot Divide, is a designated National Recreation Trail, and has long been used by indigenous peoples, then trappers, and now outdoor enthusiasts. Historic evidence indicates early Native Americans used selected sites along the Divide for killing game that crossed or were driven from one side to the other. Approximately 150 acres of the St. Joe River has been classified as Wild under the Wild & Scenic Rivers Act. Finally, considerable early day mining and Forest Service activity has left scattered traces on the areas boundary. The pressing need to protect this area cannot be overstated. Wilderness designation would safeguard the pivotal integrity and purity of the headwaters of two substantial river systems.